It's an interesting take on mesh networking topology, but there are faster solutions in this price range. 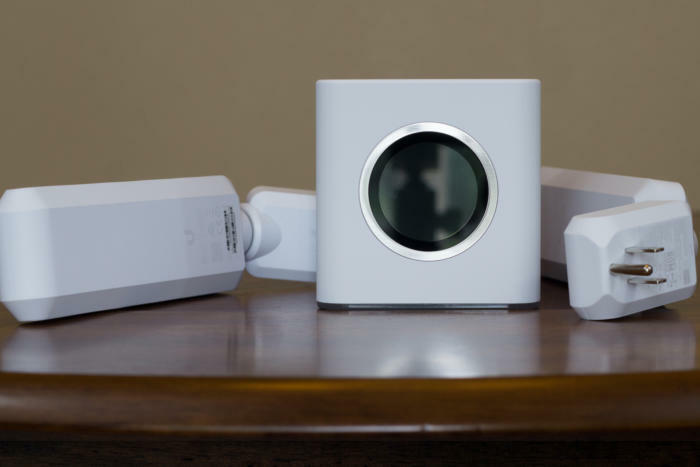 Note: This review is based on the performance of the Amplifi HD with Mac clients. If you’d like to read a version with analysis based on performance with Windows clients, follow this link. The Amplifi HD Mesh WiFi System ($349) is the latest router designed to earn placement out in the open, versus being hidden in the closet. It consists of a dual-band 802.11ac router that comes pre-paired with two 802.11ac mesh nodes (Ubiquiti calls them “meshpoints”). The router is an attractive 4-inch cube with a circular (2 inches in diameter) color LCD touchscreen on its face, and a gigabit WAN port and four-port gigabit switch in the back. There’s also a USB port on the back, but it’s currently dormant (the company says it has future plans for the port, but didn’t provide any hints as to what those might be). There’s a white LED around the bottom border of the router, but you can dim its brightness—or turn it off altogether—if you don’t like the effect. There’s also a night mode setting that will turn the LED and the LCD off automatically. This is a good time to be in the market for a new Wi-Fi router because there are so many good products to choose from. Is Ubiquiti’s Amplifi one of them? On the upside, it’s very attractive and—perhaps more importantly—it has a four-port switch. It’s easy to set up and its companion app is very easy to use. 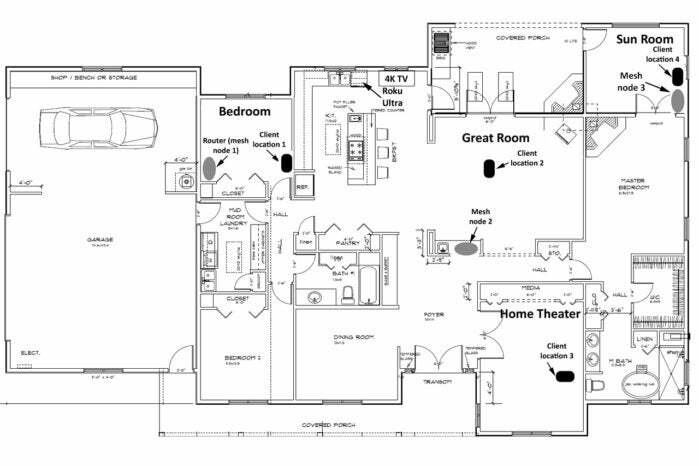 The mesh network it builds provides good coverage with three nodes—in fact, two nodes would probably be sufficient to cover my 2800-square-foot home. Amplifi HD is attractive from a cost perspective, with a three-node system priced at $50 less than Netgear’s hub-and-satellite offering and $150 less than a three-node Linksys Velop. On the other hand, both the Linksys Velop and the Netgear Orbi delivered even higher performance than the Amplifi. 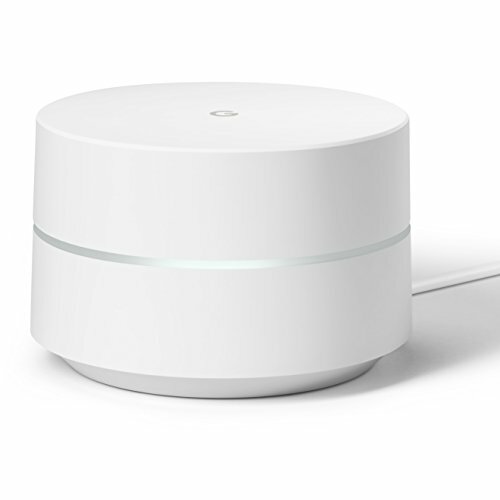 And both the Velop’s and the Orbi’s mesh nodes support wired backhaul today, if you consider that an important feature (it is if you have lots of ethernet drops in your house, as uncommon as that might be). A two-node Velop system costs slightly more (street price, that is) than a three-node Amplifi, but it performed better in my home. 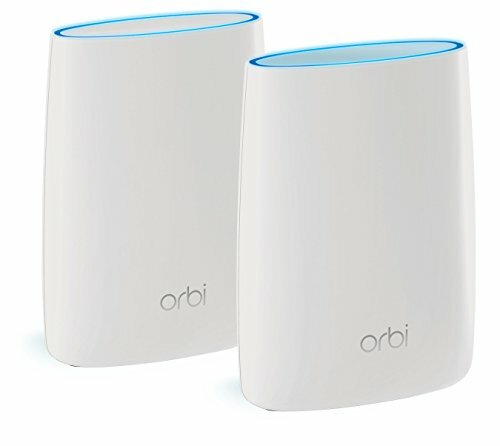 The two-station Orbi beat the three-node Amplifi HD across the board, but it costs $50 more than either the Linksys or Ubiquiti systems. The router is different than any mesh router we’ve seen before—and not just because it’s a cube. It operates one network on the 2.4GHz frequency band with a 3x3 radio (three spatial streams in each direction) offering throughput of up to 450Mbps. A second network on the 5GHz frequency band has a 3x3 radio offering throughput up to 1300Mbps. 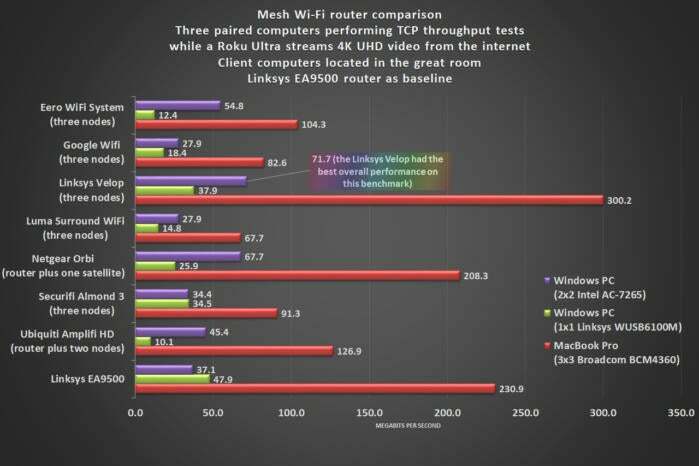 The Eero, Google Wifi, Linksys Velop, and Luma Surround WiFi are all 2x2 mesh routers. The Velop operates a third 2x2 network on the 5GHz band that’s dedicated to data backhaul. 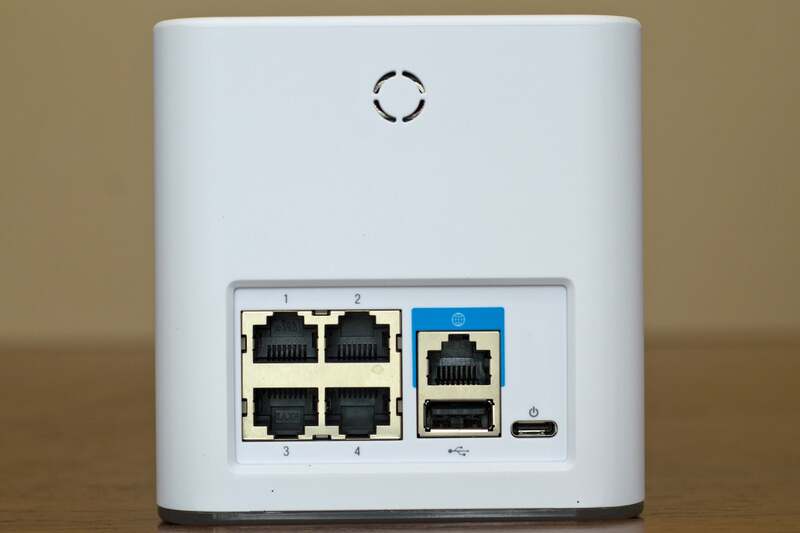 The hub-and-spoke Netgear Orbi is a 2x2 router with a third 4x4 network on the 5GHz band that’s dedicated to wireless data backhaul from its wireless satellites. The Amplifi HD mesh nodes are unlike anything else on the market as well: They plug directly into an AC outlet and have 7-inch long enclosures that mount on a magnetic ball attached to the AC adapter. A stack of five blue LEDs glow to confirm that the mesh node has connected with the router—the more LEDs that glow, the stronger the connection. Signal strength is also displayed in the Amplifi app. The ball allows the antenna to pivot in almost any direction, so you can fine tune its reception in concert with the Amplifi smartphone app. 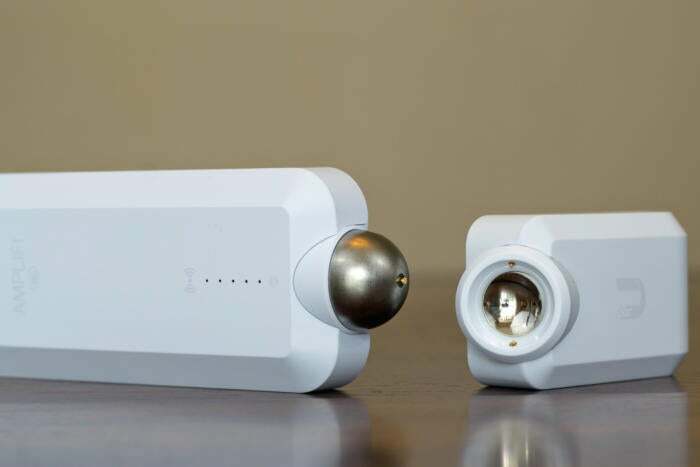 The Amplifi’s detachable antennas could be a lifesaver or a curse, depending on your home’s environment. When I test Wi-Fi routers, I place the router on a table outside the closet containing my home-run. 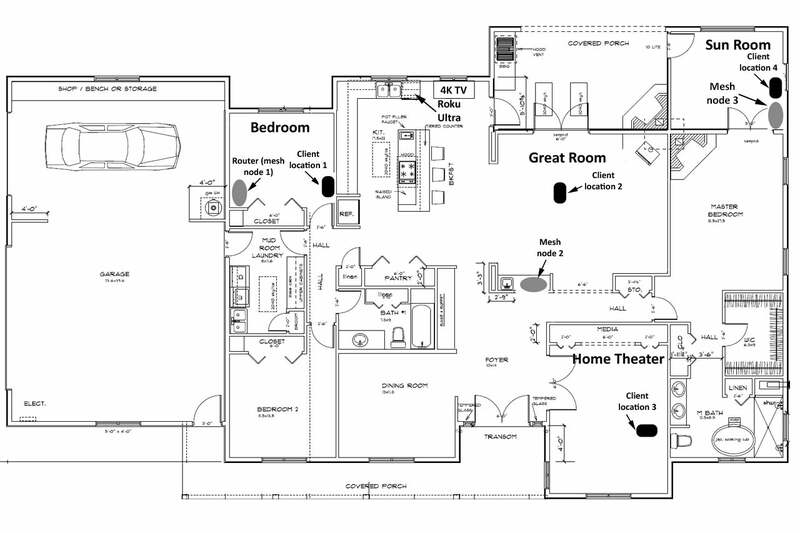 But that room is on the far side of my house and the locations I place the client computers (I test with both a PC and a Mac) fan out from there. 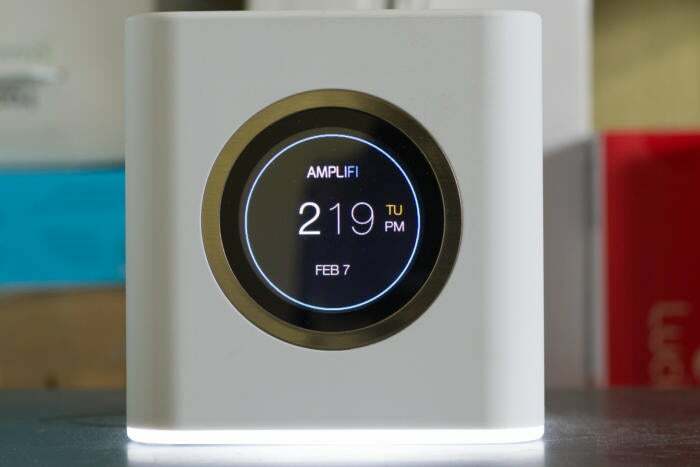 The Amplifi app nonetheless indicated that each mesh node was connecting directly to the router. 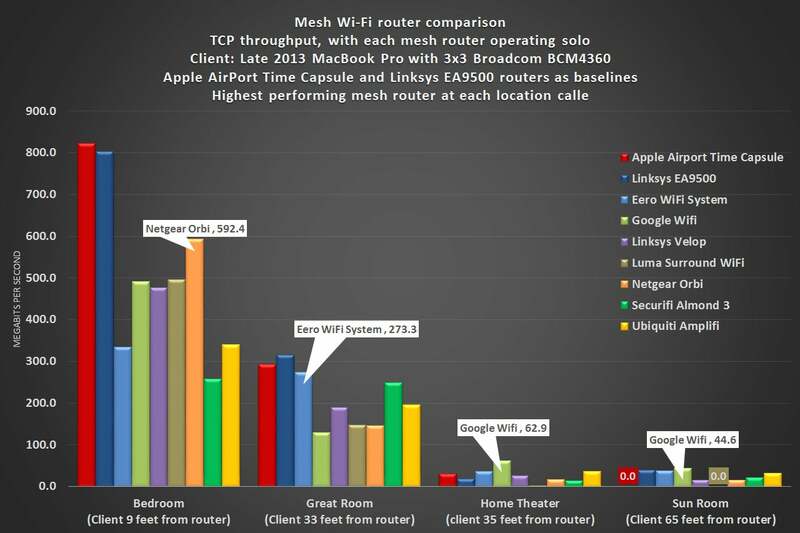 Clients are automatically steered to the strongest access point, whether that be the router or one of the mesh nodes. You can perform the earliest installation steps on a Mac with a web browser, but you’ll need to use the Amplifi app—there are Android and iOS versions—to finish. You’ll also need the app to get to the nitty-gritty settings, of which there are many. Router nerds will be pleased—mostly. You can get down to levels of detail such as which channels each network will use, you can set up a guest network with its own unique password, and there are provisions for port-forwarding rules, but it doesn’t allow you to assign one wireless client higher priority over another. 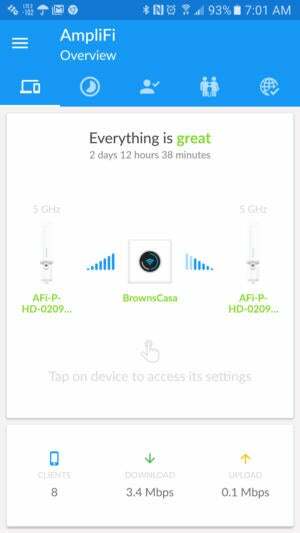 The well-designed Amplifi app is easy to use and surfaces the nitty-gritty details of your Wi-Fi network. This chart shows how the Amplifi HD performed with just the router and then with one and two mesh nodes added in. The router and one node proved to be the sweet spot in my home. At close range, with the MacBook Pro 9 feet from the router with a clear line of sight, the Ubiquiti Amplifi without any satellite nodes was faster than only two of the competitors it was compared to: the Eero WiFi system and the Securifi Almond 3. The first-place-finishing Netgear Orbi was faster by more than 250Mbps. When I moved the client into the great room, 33 feet from the router with an insulated wall, some plywood cabinets, and a number of kitchen appliances in the signal path, the Amplifi HD moved into third place behind the Eero WiFi System and the Securifi Almond 3, delivering TCP throughput of 195.1Mbps. 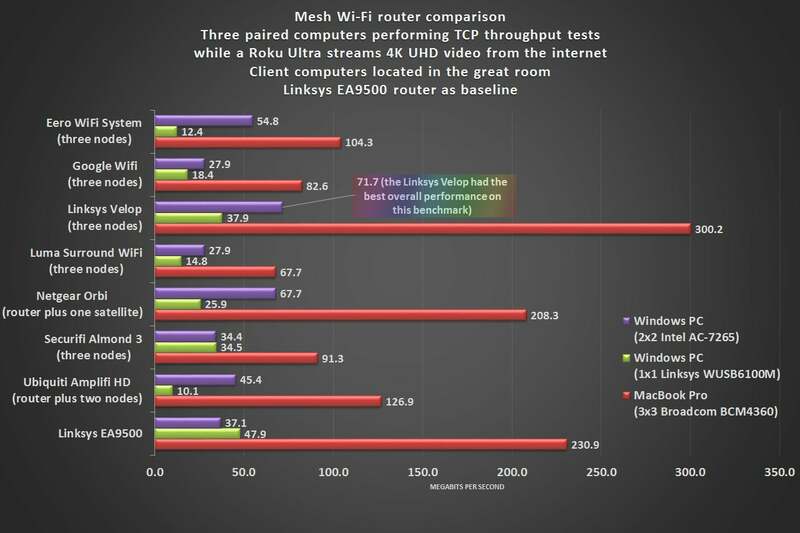 Ubiquiti’s router did a relatively good job of penetrating the thick walls of the home theater, but now it took a distant second place to the Google Wifi, delivering 36.9Mbps to the Google router’s 62.9Mbps. 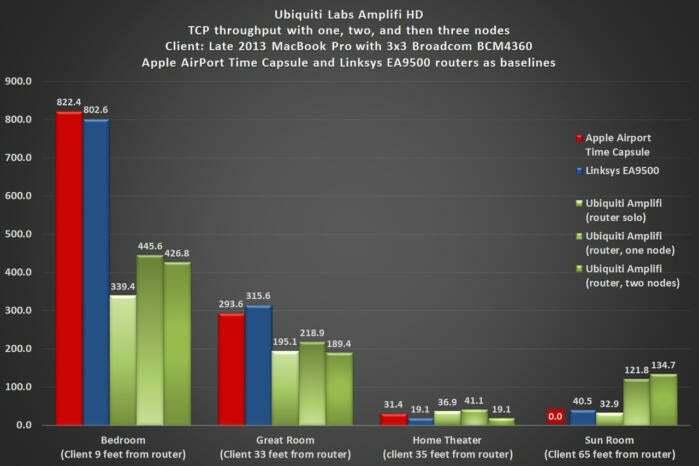 The Amplifi HD finished third behind the Google Wifi and the Eero when the MacBook Pro was furthest from the router, 65 feet and separated by several walls, but the margins were closer. Bottom line: I wouldn’t recommend using this router by itself in a larger home. 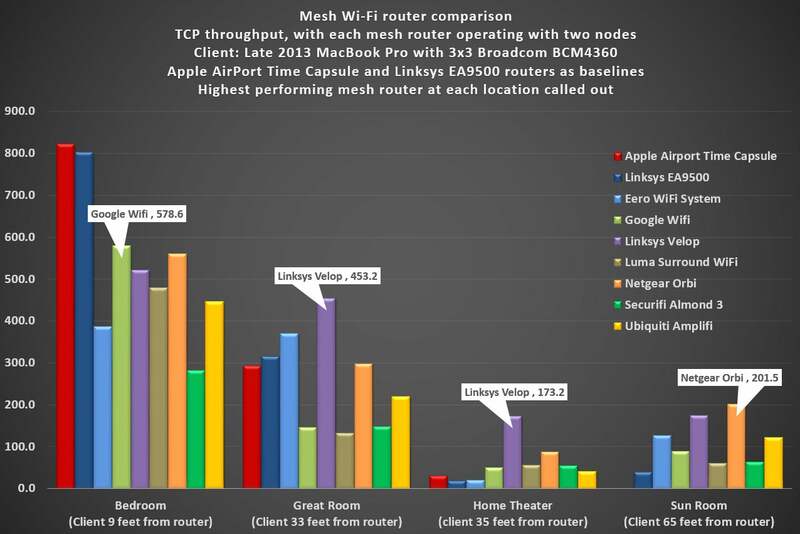 Adding one mesh node had a modest impact on near-field performance, and it significantly increased TCP throughput when the client was in the sun room, but competitors were faster at every test location. 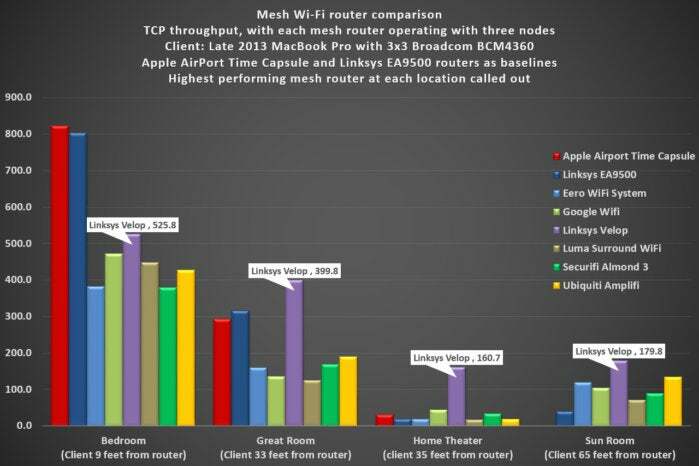 The Linksys Velop, for instance, was more than four times faster when the MacBook Pro was in the home theater, and the Netgear Orbi was nearly two-thirds faster when the client was in the sun room. 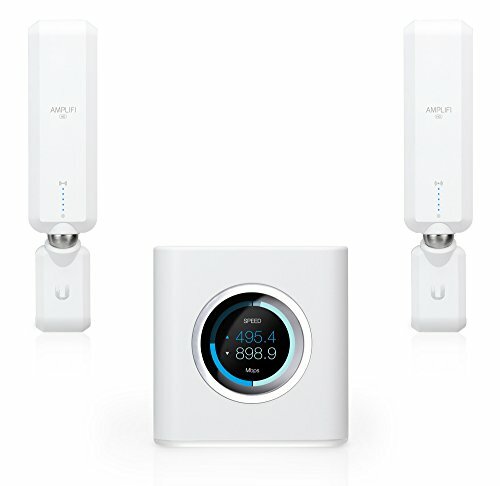 Most people who buy Ubiquiti’s Amplifi HD will likely purchase the router with two mesh points, as the package costs $60 less than buying the components piecemeal. But I saw only modest bumps in performance when I added a second mesh point to the equation (three nodes in all, including the router). TCP throughput at close range and to the great room increased slightly, the home theater numbers doubled, but my longest-range numbers actually declined. Now look at the chart below: The three-node Linksys Velop placed first in every test location, and by very wide margins in two of the four. What’s more, the Velop operating with just two nodes ($349.99 at Amazon) was also faster than the Amplifi HD operating with three.